All downloads for this site are on this page. Generally, we offer two types of downloads: the zip file and the corresponding file in HXA format. Please validate the downloaded file's checksum is the same as the respective checksums found here. fciv -sha program name and examining the output. If the long series of numbers and letters are identical to the ones here, the file is probably identical to one generated by me. Going forward, both YULL.EXE and YULLG.EXE will have the same major version number. The distribution includes YULLG.EXE version 3.00 and Yull.EXE version 3.00. MonoBits will output the number of 1 bits and the number of 0 bits in a file and then output their ratio. All Monobits does is output to console how many 1 bits and how many 0 bits are in a file as well as their ratio. I wrote it because I thought purely random files will likely have a close ratio of 0s to 1s. Not sure if this is true (or obvious). But there it is. Yull-Reg must be run in an Administrator's CLI. Yull-Reg will assume you have set up your default environment. //File Checksum Integrity Verifier version 2.05. Yull-Reg.exe is a console application that adds, modifies and deletes Yull-related entries in the Registry that support the Explorer Context menu. You might want to make using Yull easier for the members of your group by adding Yull to the Explorer context menu. With Yull added to your Explorer Context menu, when you right-click on a file you will get YullEncrypt and YullDecrypt as choices. Running Yull from the Explorer Context menu is the same as running it from the command line or from the GUI except that you don't have to worry about the path to Yull or where the options file is. That's all handled by the Context Menu and Registry settings. And of course, they can be modified by Yull-Reg, running in Administrator mode, as needed. 1. The registry entries for Yull are YullEncrypt and YullDecrypt. They are handled by Yull-Reg.exe. Before you run Yull-Reg, you need to create or designate a Yull key file. Yull can use any file as a key, within the size range of 100-10,0000 bytes. Or you can instruct Yull to create a key file for you. If you already have a Key File and an options file, you are just about good to go. Of course, the R:\yulloptions is just an example here. From Explorer, when you right click on a file and select, say, YullEncrypt, Explorer will extract the command line from the Registry and run it as a Command, passing in the file you right-clicked on as the parameter (the %1). c:\yullinstallation\yull.exe and R:\yulloptions are just examples. They would be different on your computer(s). During development of Yull I had need of files of specific sizes as well as the ability to easily change those files with certain kinds of data (text or numerica). So I created this simple application, File Resizer. 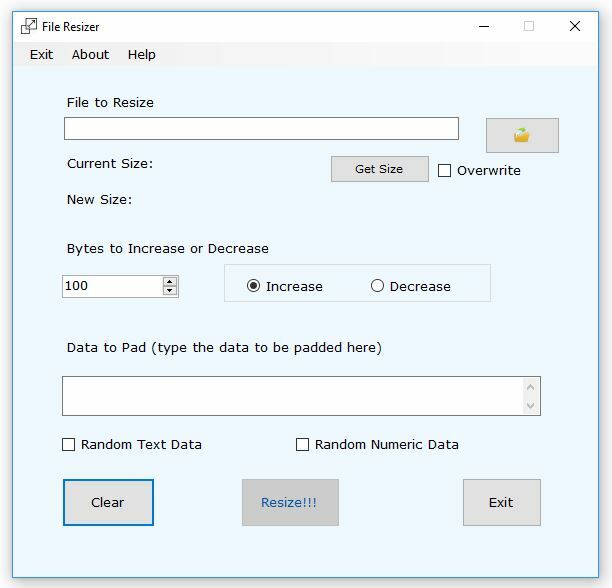 File Resizer changes file sizes by appending data to the end of a file or by deleting data from the end of a file. It does not keep a record of what it does. It is IMPORTANT TO NOTE THAT changing a file's size may have serious consequences if that file is relied upon by programs. FCOMP.EXE is my version of FC, the DOS command. FC="File Compare". The problem with FC is that it outputs too much information if the files are different. All I usually want to know is: are the two files identical or not. This is for HXA.exe version 3.04 (note the new numbering). This program will convert any file into a HEXASCII representation of that file and back again. You can also encrypt the output. Note: As with my other apps, NO INSTALLATION NECESSARY. NOTE: The latest version is NOT 1.33 but 3.04. HEXASCII is an ASCII text representation of binary values. So a binary value like 0, or 99 or 254, when written as Hexadecimal is 0x00, 0x63 and 0xFE (The 0x is just way to denote the following two letters/numbers represent a "hexadecimal" number. 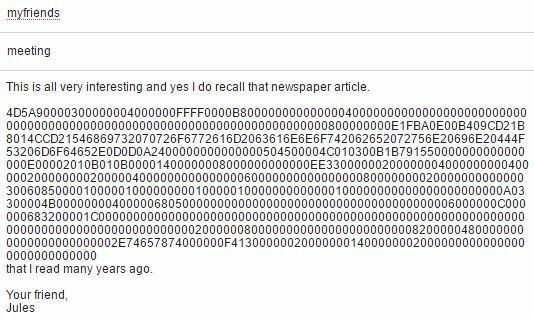 See Hexadecimal explanation on Wikipedia. Hexadecimal is a base-16 number system. Like base 10 with which we are all familiar where a number like 99 is "really" 9x10 + 9 (and even more really, 9x101+9x100). (Any number raised to the 0th power is 1.) In Hexadecimal, instead of multiplying numbers by powers of 10 we use powers of 16. And represent numbers between Decimal 10 and Decimal 15 by letters A,B,C,D,E,F. So 0xFE is (in decimal) 15x161+14x160, or 254. (Remember: any number raised to the 0th power is 1). So when written as HEXASCII these numbers would be "FE", so just letters and numbers. What this program does is this, going from binary to ascii. Oh,binary of course includes ASCII in that binary values range from 0 to 255, which is all possible values for a byte and one byte = one ASCII character. (ASCII: American Standard Code for Information Interchange). ASCII values in this case are the letters A-F and the numbers 0-9. The program takes a byte value like, say, 0x20, which is the "space" character (decimal value 32) and converts it into "20". It takes the hex value 0x9F which is decimal 159 or 9x16+15, and converts it into "9F" and so forth. In this example, 57 is the ASCII representation of "W" (remember: in hexadecimal, so it is 0x57) as in "What this program does". 68 is "h" from "What" and so forth. This could be useful in sending binary files like executables and zip files as well as anything else as a "text" attachment. Or even in the body of an email. On the other end, just save the attachment as whatever you want and run HXA with DIRECTION=ORIGINAL giving the outputted file any suitable name. If I wanted to send someone an executable I wrote called, say, test.exe, I could not via email in general and often saving such files as downloads from the Internet causes warnings. 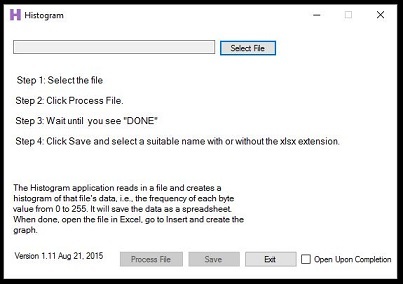 If I convert test.exe to, say test.hxa via HXA and then attach it and email it. 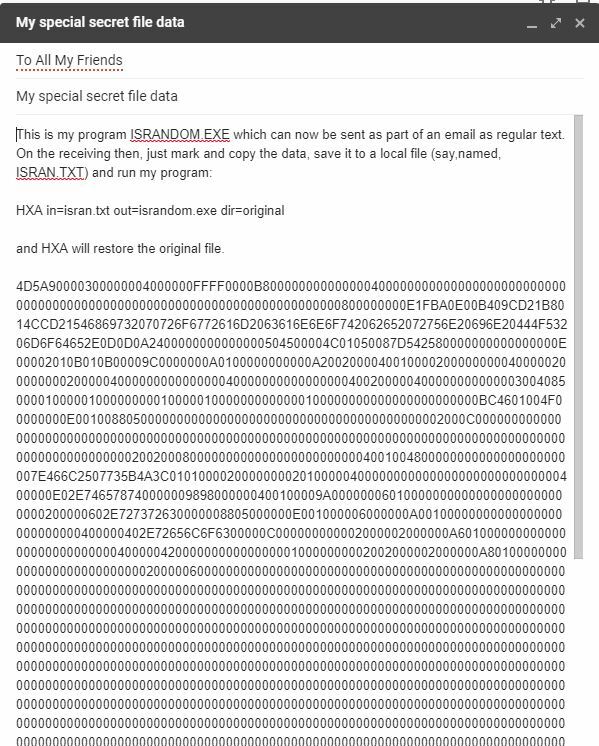 On the receiving end, save the attachment as test.hxa (or whatever you want), run HXA and you're done, having sent an executable via email. You could also send your file in the body of the email and on the receiving end, save that text (being careful to just save that text and nothing else, not even a line return because the program will error out), convert it back to "binary" and you're done. An example of sending "hex ascii data" via email. Remember, from the point of view of the Internet and your email program, this is no different from "Hi, how are you?" apart from the number of letters. This is also encrypted. Of course both the sender and receiver(s) would have to use the same key the key is just a series of text letters and numbers, sent previously. Like, suppose the key is "I love you". I could call you a week earlier and say the key is "I love you" and then use that string of letters to encrypt the data. From the point of view of HXA it doesn't matter if the key is only a few letters or thousands (to a limit of 32565). Important to note: HXA will only convert from HEXASCII. So you would have to select that range of HEXASCII from the email, save it to a file and then run HXA on it, direction=original. 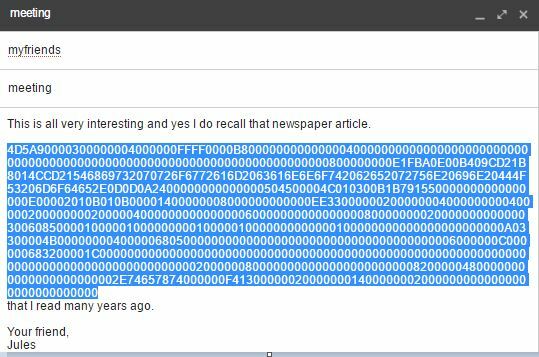 If you do embed the HEXASCII within a mail message (or any other type of file), you must not add extraneous characters, which includes returns, paragraph breaks, etc., any "invisible" characters as that will make the hexascii not usable. direction=ascii instructs HXA to convert the infile to hex ascii. direction=original instructs HXA to convert the infile, which was previously converted to HEX ASCII back to its original format. The key is optional. It is just a series of printable characters like "I like HXA" or "A" or "Whatever you feel like etc." Anything that can be on a command line, even gigantic text files; whatever. HXA will use the key to create a SHA512 hash which is used to encrypt the data before it is converted to HEX ASCII and back again. As with all keys, you must use the same key for each direction. Note: The range of values for the key is all values that can be inputted via any mechanism. They can be normal ASCII letters, or bytes inputted via the ALT-Numeric keypad or alt+0+numeric keypad. The key can be up to 32565 characters long. Overwrite=true instructs HXA to overwrite the output file. The default for Overwrite is FALSE. NOTE: The version of HXA which is 1.22 is NOT LIKE THE PREVIOUS HXA (i.e., pre-version 1.1156b regarding encryption. Version 1.156b added dummy data like Yull does to the encryption so the OUTPUT file will, when using encryption ALWAYS be larger than the input file. HXA Version 1.22 Copyright (c) 2015-2016 Ronald Gans. All rights reserved. Just a simple text file. With HXA you can safely transmit any file. My impression is that the download is much faster than with binary files. The conversion from HXA format to binary takes way under a second. Since the output of HXA for direction=ASCII is just a series of printable letters, you can store them within any other file that can handle ASCII letters, like Word, for instance. So you can embed them within a Word document (or in a cell in a spreadsheet), of course TAKING CARE TO MAKE SURE THE TEXT REMAINS UNCHANGED, even line endings will cause a problem since a file with line endings is NOT HEXASCII and HXA will reject it when trying to convert back to the original. A 4,661 byte file I tested with underwent 1,037,738 encryptions. One could, if one wanted to, output a file as HEXASCII, print that file out, then scan it back in or fax it (Old School!!!) (making sure nothing was changed), and run HXA on it again to get back the original file. Starting with Version 2.0, HXA will only require a file name (either Fully Qualfiied or just local). If there are no other parameters, HXA will assume that the file is to be converted into HexAscii. It will append .HXA to the file and overwrite any file of the same name. This is for RandNumGen.exe. This program will output a desired number of pseudo-random numbers to a file in either comma-delimited hexadecimal ascii (like "0x0d, 0x0a"), or binary. Please visit my Odds and Ends page for details on RandNumGen. I have use of this. Don't know if anyone else does. Console.WriteLine(@"Ronald Gans Software Copyright (c) 2016 All Rights Reserved. This app may be freely distributed without any restrictions at all. This program will extract all text (i.e., printable ASCII) from any file. Ever wonder what's in an .EXE file? Or any other non-text file? Well, now with TextFromFile.exe you can find out. TextFromFile.exe will extract all the printable characters from a file and write them to an output file of your choosing. TextFromFile.exe is small and fast and extremely easy to use.